The media regularly use public opinion polls in their reporting of important news stories. But how exactly do they report them and to what end? In this insightful and accessible interview, Professor Justin Lewis demonstrates the way in which polling data are themselves used by the media to not just reflect what Americans think but instead to construct public opinion itself. 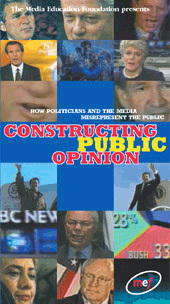 Addressing vital issues (e.g., the role the media play in 'manufacturing consent' for political elites, what polls really tell us about public opinion, what Americans actually think about politics), Constructing Public Opinion provides a new way to think about the relationship between politics, media and the public.